A rendering of the proposed Station Plaza. 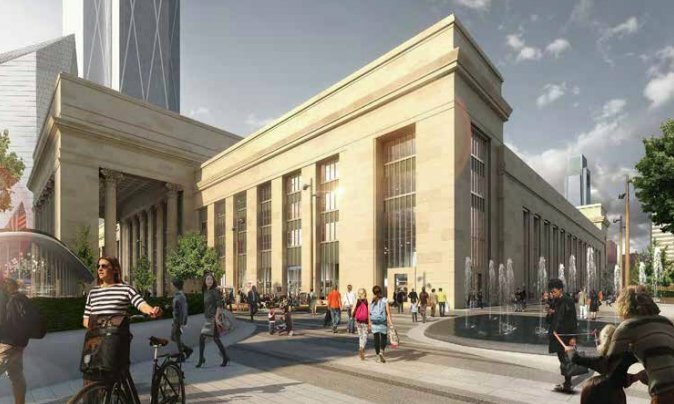 The project, tied to the ambitious 30th Street Station District plan, aims to transform the area into a pedestrian-friendly and aesthetically pleasing civic space. 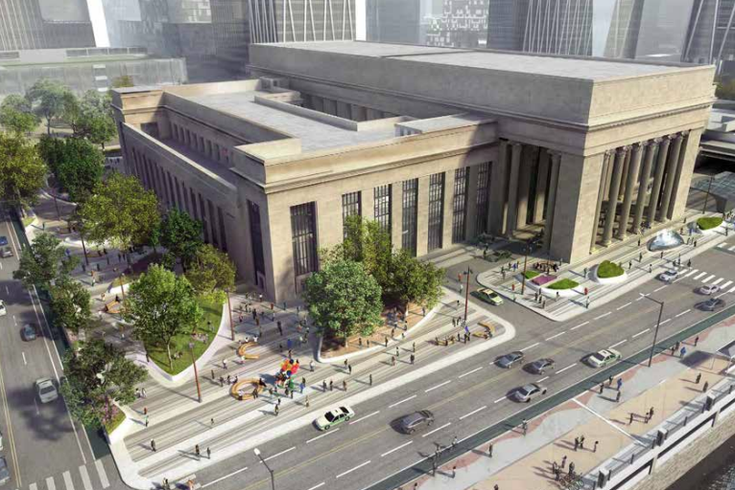 "Today, 30th Street Station sits surrounded by a sea of driveways, parking, and other automobile infrastructure, rendering its exterior space less than ideal for pedestrian activity," the plan states. 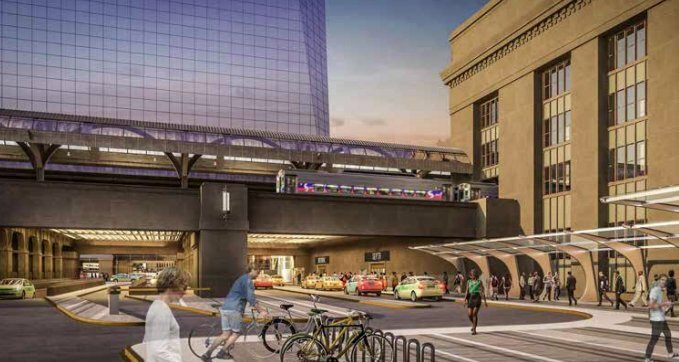 Among the major changes proposed is a proposed entryway to the planned West Underground Concourse, which would be an underground connection between 30th Street Station and SEPTA's subway and trolleys. A rendering of the proposed entry to the West Underground Concourse. The plan also calls for separate pickup and drop-off areas at opposite sides of the station for taxies or ride-sharing companies. Currently, cabs pick up and drop off travelers at the station's east portico, often clogging the area with traffic. A proposed drop-off at the east portico would put travelers closest to the Amtrak section of the station, and the pickup area would be on the west side, under the SEPTA Regional Rail overpass. Rendering of the proposed taxi pickup area outside the west side of the station, under the SEPTA Regional Rail overpass. The plan cites The Porch, a University City District-provided public space on the station's south side, as an inspiration for developing a permanent public area. 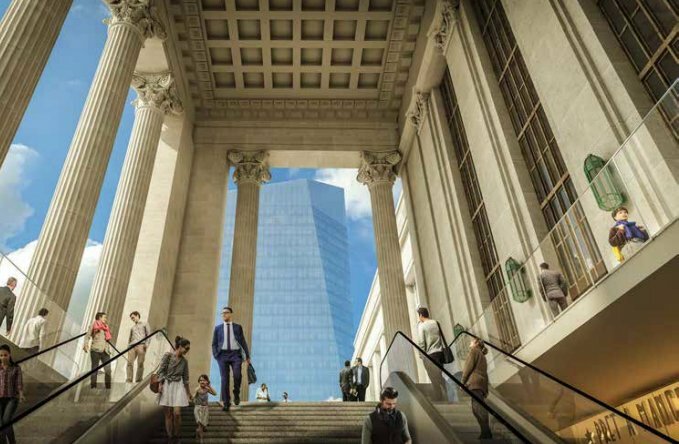 Rendering of a proposed circulation path to the west portico. Designers FXFOWLE, !melk and ARUP jointly presented the concept at a public open house in July. Amtrak has said it plans to start construction on the Station Plaza by around 2020 and complete it sometime between 2025 and 2030. The full 30th Street Station District Plan is laid out over a 35-year timeline and covers some 88 acres of land. Officials plan to add 18 million square feet of new development space and 40 acres of open space. Amtrak's 107-page preferred concept plan, which includes more information and designs, can be found here.